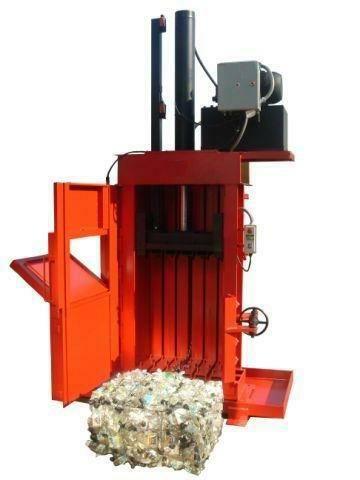 For locations with tight spaces and waste recyclables that accumulate quickly, a small 30" Baler can be an excellent way to handle the problem. Depending upon material volume and budget, the three 30 inch Balers below provide a lot of range and versatility. The small High Density Baler is popular for clothing and textiles as well as corrugated cardboard. Bale weights of corrugated cardboard can range from 150 - 250 pounds, which is much easier to manage compared with the larger balers. The 30" Super High Density Baler has massive power compared to most 30" Balers and is excellent for PET Plastic and Shrink Wrap. These balers will produce small compact bales of materials such as PET Plastic Bottles, Shrink Wrap, HPDE, Aluminium Cans and Steel cans, as well as office paper. Bale Size 24" x 30"x up to 25"
Bale Size 24" x 30"x up to 30"
Bale Size 30" x 16"x up to 24"